In case you’ve had your head buried in the sand for the last few months and haven’t heard, Kigali has a gelato place and it’s glorious! Ice cream is my main food weakness (and cookies… and cheese… and tacos…) and I was very pumped when I noticed a sign for Delizia Italiana and at Kigali Heights and heard about all of the amazing things they planned to sell. It took several months of teasing before they actually opened their doors but, now that they have, they’ve become Kigali’s hot spot for gelato and all things Italian. For a place known as the go to for gelato, Delizia Italiana also has a very nice selection of food. They do Italian cheese and cured meat plates (Rwf 6,000 to 8,000), tasty pressed sandwiches, and something called ‘piadines’ (Rwf 4,000 to 5,500) which were totally new to me, who is uncultured in the ways of the Italians. On the menu the piadine is described as an ‘authentic romagnol’ which doesn’t do anything to demystify it for me. So I, of course, had to order one to give it a try. The bread is sort of like a thicker tortilla and it’s filled in like a sandwich and folded in half. There are ten different types to choose from filled with various combinations of Italian cheese and cured meat. I tried the ‘Piadina Bolognaise’ with mortadella, Fontina cheese, lettuce, and tomato. I really liked the idea of the flat bread but I found mine to have a sweetness to it that was a bit too unusual for boring old me. Someone later told me that it might have been the pumpkin paste that added the sweetness so I’ll have to give the piadine another chance without it. They also offer specials and I opted to give their lasagne (Rwf 8,000) a try the last time I was there, and it was a damned fine lasagne. I’ve also noticed pasta salad on their specials board but I haven’t tried it yet. I see myself coming here a lot in the future so it’s nice to see that they seem to have a changing menu so there’s often something new to try. Check the bulletin board outside for their specials. They also have a pretty well-stocked section inside offering Italian meats, cheese, and even specialty items like truffle oil for sale. If you want to splash out and cook a nice meal, stop by here for some inspiration first because they have some nice things you won’t find anywhere else. So sandwiches, wine, and Italian cheese and meat are all great reasons to come to Delizia Italiana but lets not kid ourselves here – it’s all about the gelato, people! It’s the gelato that lured me in in the first place and it’s the gelato that keeps me coming back on the regular. 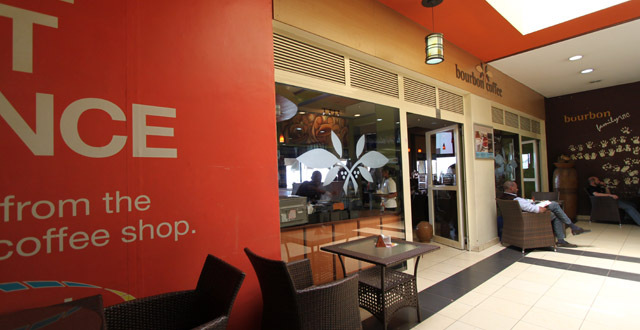 Until recently, Kigali had been a black hole for ice cream lovers. Bourbon made some ok flavours and occasionally you could find decent (but super expensive) ice cream in tubs from Frulep but, overall, times were tough. Kimy Gourmand opened a few years ago and saved the day with their amazing Speculoos, mocha, and coconut flavours; Kubram’s Place opened up with some decent fruity ice cream flavours but closed soon after; and Java House makes a mean milkshake, but nowhere can really compare to what’s on offer at Delizia Italiana. They have an great selection of about 15 choice with half of the cabinet dedicated to fruit flavours and sorbets and the other half with the flavours I tend to gravitate towards like chocolate and mint. Even though I’m not much of a fruit ice cream person, I always give a new flavour a try and I can vouch for them be absolutely crammed with flavour. It’s find of insane how flavourful they are… how do they do that? I tend not to stray too far from flavours involving chocolate, but I really would recommend trying something new each time you go because you’ll discover something you never would have expected to like. Like pear and ricotta! I have little love for either pear or ricotta but together in ice cream form? It’s kind of magical. The banana chocolate shake (Rwf 4,000) was super chocolatey and it tasted like it had fresh bananas in it which is a testament to the amazing flavour of their banana ice cream. They’re willing to mix up any combination of ice cream you can dream of so if you’re feeling like something fruity, combine a whole bunch of their amazing fruit flavours for a fruit cocktail shake. Or mix up some coffee flavours for something to replace your morning cup. My personal favourite is chocolate with mint with chocolate and coffee a close second. I’d love for Delizia Italiana to mix up a batch of coconut ice cream because the chocolate/coconut combo is one of my favourites. Yes, I really like chocolate. One of the things about Delizia Italiana that remains a mystery to me are the prices of their ‘Specialty Gelato’ sundaes. I feel like the large cup of gelato for Rwf 4,000 is absolutely huge so I’m curious about why their sundaes (which come in a tall glass that seems to be smaller in volume than the large cup) are double the price in some cases. I guess I’m not sure how adding mango and passion fruit to chocolate ice cream for the Passione Cioccolato (Rwf 9,000) can add Rwf 5,000 to the cost. That’s some pricey mango and passion fruit, my friends. As I don’t think I could ever bring myself to pay over $10 for a sundae, I may never find out. Luckily, I think the Coppa Standard gelato bowl at Rwf 3,000 is great value so I’ll stick with that. Delizia Italana has really positioned itself as the place to come for all things high-quality and Italian. They have a good selection of Italian wine ranging in price from Rwf 3,000 to 5,500 per glass and Rwf 14,000 to 80,000 for a bottle. You can also get a Peroni beer for Rwf 2,800 and a shot of various Italian spirits for Rwf 5,000 each. A place with wine and ice cream? Oh hell yes. If you’re feeling more like coffee, Delizia Italiana has a good selection with everything from an espresso (Rwf 1,300) to a latte (Rwf 1,900) to something called ‘Affogato Delizia’ (Rwf 4,000) which is coffee with ice cream topped with whipped cream and Nutella sauce. Next on my list of delicious-sounding things to try. 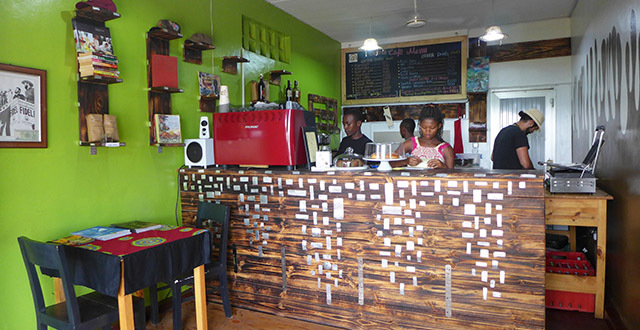 Plus they’ve got herbal teas (Rwf 1,300). My one complaint is that they’ll gouge you on water (Rwf 1,100) and pop (Rwf 1,400) which is not cool, but I guess that’s business. The owner and staff here are very friendly and the place is well-run which is refreshing. The atmosphere is really welcoming and I like the decor and general vibe of the place. The wifi here is good and I really like working from here because… ice cream! Delizia Italiana have put a lot of thought into their place and they’ve taken time to get things just right. You can tell they’ve put a lot into training and that they value customer feedback and really want to make your experience there an excellent one. I’m excited to see high-quality places like Delizia Italiana opening up. Places like this are what keeps pushing Kigali’s food scene in the right direction and you really must try it immediately. This is place is way over priced and over hyped. Since when was icecream considered a luxury item?